I’ve been using the Xbox One S for a while now, and it’s become clear that Microsoft has a winner on its hands. Those users already invested heavily in the world of PlayStation 4 should consider the PlayStation 4 Pro instead of the Xbox One S. Already having the games means saving one’s self from paying a boatload of money buying them all again – that’s obvious. On the other hand, that device looks like someone smashed a PS4 to a thinner size, then slapped another layer on top of it to make a console sandwich. Of course the exterior look of the console doesn’t matter as much as its capabilities, but it is something to consider. The Xbox One S also plays UHD (4K) Blu-ray videos while the PS4 Pro does not. This is very much like any other console-wars purchase – it all depends on which family you’re already a part of. 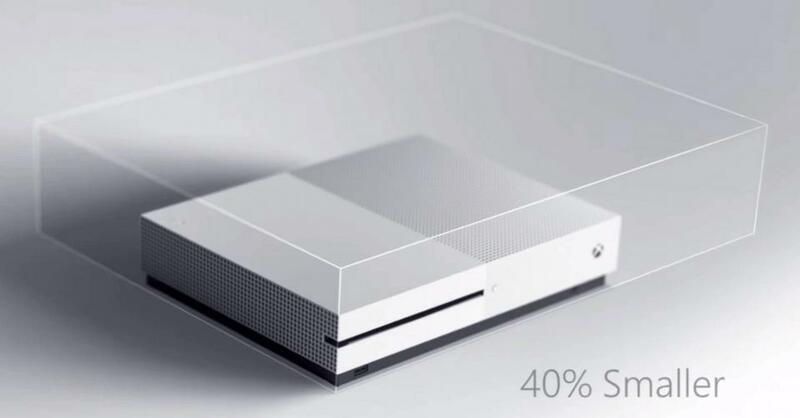 The Xbox One S comes in three sizes – the same casing, just three different internal storage sizes. Different versions include 500GB, 1TB, and 2TB of space inside the machine for data storage. This device comes in several special editions, as well – again, we’re working with the 1TB model here. This device has a single power port – with the power converter inside the machine so there’s no giant hunk on the power cord to deal with. Also included are 3x USB 3.0 ports, two on the back, one up front. A single HDMI-out port provides 4K output capabilities – that’s HDMI 2.0 output with HDCP 2.2 copy protection support. Another HDMI port provides HDMI-in, allowing users to run other devices along the same daisy-chain of video through to their tv. This same capability was also offered on the Xbox One. This box has an IR-out port for an external IR blaster, strange since there’s already an IR input bit up front. Optical ethernet is here for the web, and an optical audio port is here too. This model is 40% smaller than its predecessor, and it shows. The Xbox One was a giant hunk compared to this. The Xbox One S is what the Xbox One should have been as a follow-up to the Xbox 360 – clean lines like the Xbox One, but in a package that’s reasonably sized. The controller is ever-so-slightly smaller than the standard Xbox One controller and feels just as natural to use. The original Xbox One wireless controller was the first Xbox controller I found to be on-par with Sony’s DualShock offerings. This Xbox One S wireless controller is just a tiny bit better. Or a whole lot better if the slightly grippier surface is what you’re focusing on. The Xbox One S plays Blu-ray disks flawlessly. While I had trouble from time to time getting Blu-rays and DVDs to work on the original Xbox One, the Xbox One S has played every disk I’ve tried, instantly. This unit also has access to a litany of entertainment apps – Netflix, Hulu, YouTube, HBO GO, FX Now, Twitch, Amazon Video, Comedy Central, and SeeSo. We’re able to use Skype to chat (voice only) or with video – just so long as we have the converter that turns a USB port into one able to utilize a Kinect. This controller also works with some Bluetooth support, running with Windows 10 devices playing some of the very latest Xbox games. Gaming on the Xbox One S isn’t all that different from gaming on the Xbox One. At least, that’s what it seems like when we’re using this machine with a 1080p display. When we ramp up to a 4K display, things get a bit more interesting. The processor on the original Xbox One rolls with a 1.75GHz 8-core AMD Jaguar CPU and a 1.31 TFLOP AMD Radeon GPU and 8GB DDR3 RAM. The new Xbox One S has a 1.75GHz 8-core AMD Jaguar CPU with 1.4 TFLOP AMD Radeon GPU and 8GB DDR3 RAM. All the games that work on the Xbox One work on the Xbox One S. There won’t be any games that work on the Xbox One S that don’t work on the original Xbox One. There’ll be a new Xbox console released next year if the rumors come true – that will be a console that’ll have games that wont work on the Xbox One. Finding another 4K Blu-ray player for the prices this unit is being offered at won’t be easy at this stage in the game. While the competition in this category just offers the Blu-ray player capabilities, this device has much, much more. While the Xbox One S is meant to be both a gaming console and a Blu-ray player all in one, it’s difficult to get past the idea that this is easily the best 4K Blu-ray player on the market today, considering its price and capabilities. If an Xbox One can be purchased for far, far cheaper than the Xbox One S, go for the Xbox One. If a user has a choice between an Xbox One and an Xbox One S for the same price, there’s no good reason to choose the Xbox One. If the user has a 4K TV, the Xbox One S is the best choice.